Senichi Hoshino walked into a room full of reporters on a gray and rainy day in Sendai a few years back with a smile that lit up the room. 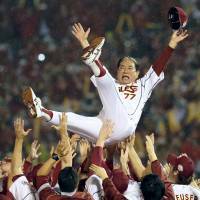 This was the day after his Tohoku Rakuten Golden Eagles won the draft lottery for the rights to pitcher Yuki Matsui and the day prior to his team hosting Game 1 of the 2013 Japan Series, and Hoshino was practically beaming. On that day, someone who had never met him may have been caught off-guard. Hoshino sat there looking jovial and distinguished. He even cracked a couple of jokes. The fire and brimstone persona the sometimes gruff manager was more known for during his career was very seemingly absent. But while it may have hard to see, the fire in Hoshino, which pushed him on a relentless pursuit of success during his playing days and later as a manager, was there and had never stopped burning. Hoshino’s passion is what many will remember after the news of his passing at age 70 on Jan. 4, began to spread on Saturday. Hoshino will be missed by baseball fans across the nation, but will always have a special place in the hearts of those in Tohoku. After that news conference in 2013, he led the Eagles to their first-ever Japan Series triumph, delivering a title, and a little joy, to a region still recovering from the devastating earthquake and tsunami of 2011. That’s not to say he won’t be remembered fondly by fans of the Chunichi Dragons and Hanshin Tigers, franchises where the spirited manager also tasted success. Hoshino had an aggressive style as a player for the Dragons, for whom he pitched for 14 years and finished 146-121 with 46 saves. He won 15 games and finished with 10 saves in 1974, the year he won his only Sawamura Award. He also reveled in cutting the Yomiuri Giants behemoth down to size, pitching well enough to have earned the nickname “Giants Killer.” As the story goes, Hoshino was supposed to have been drafted by the Kyojin, who went in another direction, sparking his long grudge. Perhaps it was a good thing, as he pitched well against Yomiuri during his career. He also managed with great zeal. Far too much at times, as his outbursts at players reportedly sometimes turned physical. Umpires were not spared his wrath either. As a manager he won pennants with three teams, two with Dragons and one each with the Tigers and Eagles. That 2013 season with the Eagles brought his career around nearly full circle, as a more mellow Hoshino oversaw a pair of pitchers who must’ve reminded him of the old days in Masahiro Tanaka and then-rookie Takahiro Norimoto. 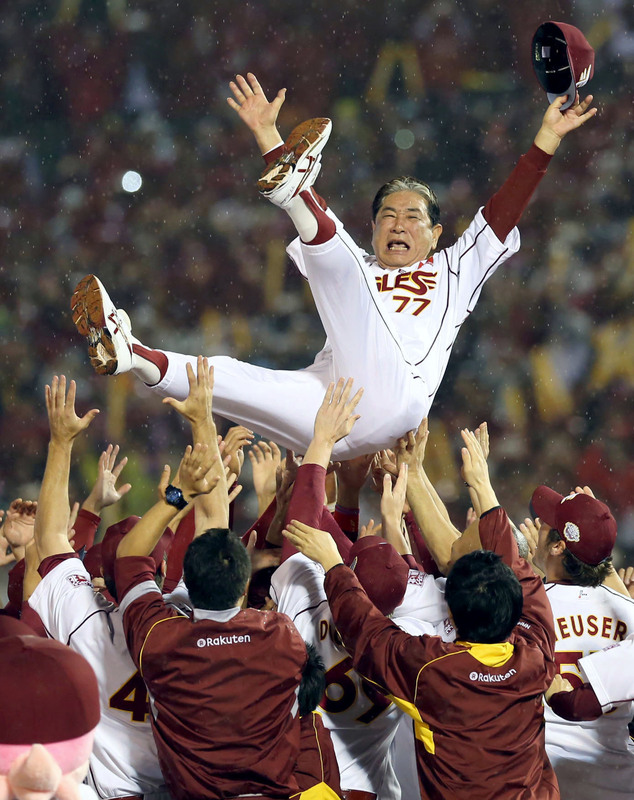 Fittingly, the Japan Series crown he won that year, his first and only, came at the expense of the hated Giants. His joy was on full display after finally claiming the crown after his previous failures. When he was tossed in the air during the doage, there was pure elation on his face. His fire was on display just as much then as it was at any time during his infamous outburts. In joy, or in full-throated anger, Hoshino’s passion was always there. That passion never faded, even after illness forced him out of the dugout in 2014. Now, it’s likely what many will remember about him for years to come.